Ellavation Scores With Jersey Branding! 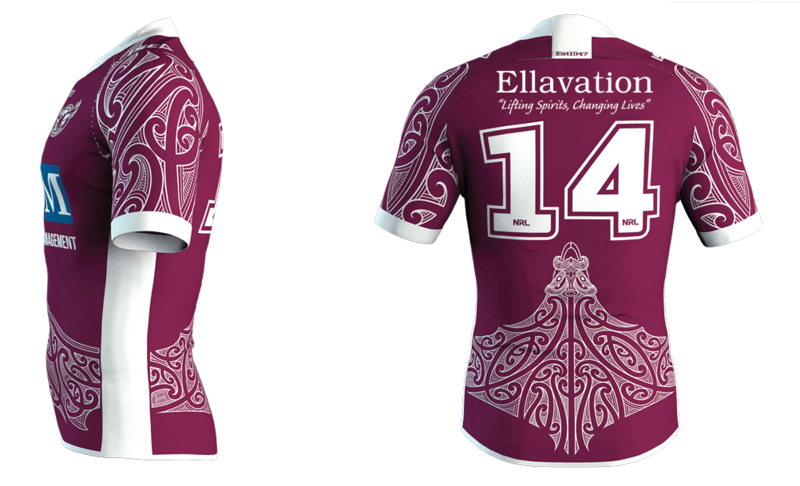 The Manly Warringah Sea Eagles have today unveiled a special Māori jersey featuring Ellavation branding across the top back position usually occupied by Premier Partner Lottoland. The special jersey, commissioned by New Zealand South Island iwi (tribe) Ngāi Tahu and designed by leading Māori artist Fayne Robinson, will be worn by the Sea Eagles for their ‘home’ game against the New Zealand Warriors in Christchurch on Saturday 9 June. “We are delighted to be donating our top back of jersey branding for this game to Ellavation,” said Lottoland Australia Marketing Director Mr Matthew Brinckley. “As a supporter of both Ellavation and the Sea Eagles, Lottoland are pleased to be able to bring together these two very community focused organisations with this great initiative recognising both Australian and New Zealand Indigenous cultures,” added Mr Brinckley. With a focus on lifting spirits and changing lives, Ellavation provides sustainable employment and career development opportunities for the Australian Indigenous community. As a corporate partner, Lottoland is helping to provide ongoing career development opportunities to Ellavation Trainees. Speaking at the unveiling of the special jersey in Christchurch this morning, Sea Eagles CEO Mr Lyall Gorman praised the initiative of Lottoland to incorporate Ellavation and the recognition of Indigenous Australia. “The fantastic design of this special Māori jersey obviously focuses on our commitment to Christchurch and recognises the Indigenous culture of the region, whilst we also felt it was very important to also recognise Indigenous Australia and to show the great link we share between our neighbouring countries,” said Mr Gorman. “Through the initiative of our Premier Partner Lottoland, we are able to feature Ellavation across the top back position and I know our players will be extremely proud to run out in these very special and meaningful jerseys come June against the Warriors here in Christchurch,” added Mr Gorman.